At the end of last year we came across an announcement via our Commodore Amiga Facebook group of an upcoming racing game that was sure to get your adrenaline going at a rapid rate. 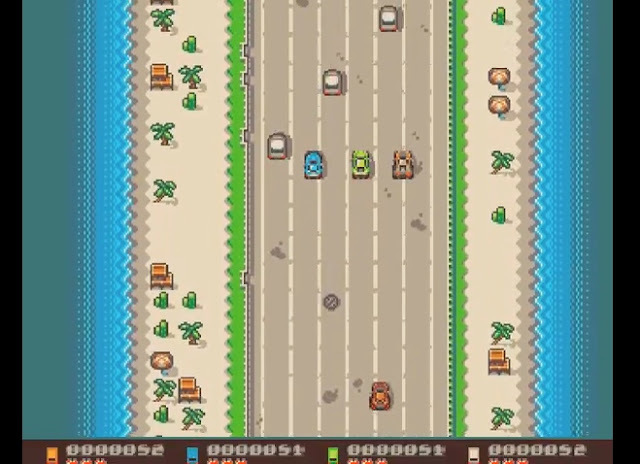 This game which was called 'Highway Sprint' and developed by a team of people such as Erik Hogan, Pixel and Simone Bernacchia. Looked to feature non stop racing fun as you race along a road at dangerous speeds while also trying not to crash into other cars. Thankfully if you have seen this game when it was first announced you'll be pleased to know it has been updated with a number of features. Craig Coope tester - Art by Pixel - code by Erik Hogan(Earok), music by Simone Bernacchia.